Hotel Brosundet is a real gem of a hotel in central Ålesund. You'll be staying right by the quayside and can even do a spot of fishing from your room! Enjoy fabulous views of Brosundet over breakfast, and some fresh fish and a cold beer at MAKI! At the Hotel Brosundet in Ålesund, guests can delight in stunning surroundings in a former packhouse right by the water. This is a great hotel for both business and pleasure where you can enjoy fabulous food all throughout the day. The Hotel Brosundet is a design hotel situated right in the heart of charming Ålesund. The hotel pays homage to the building's fascinating history, while maintaining a clear focus on the future. 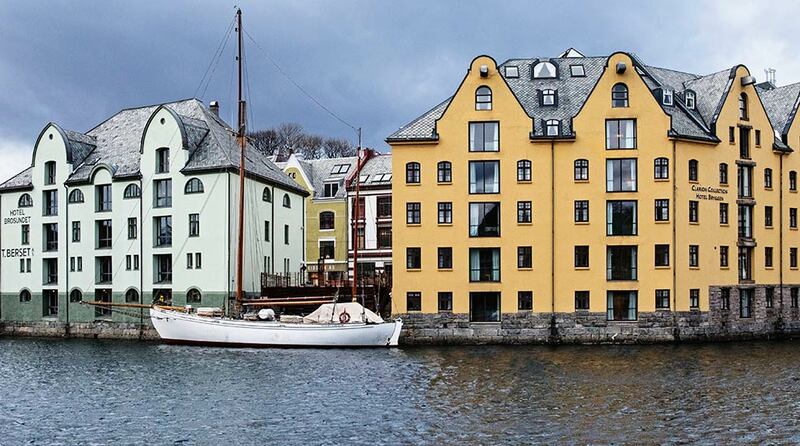 The hotel is located right on the edge of the quayside in central Ålesund. With the sea just outside the lobby, you'll be within easy reach of the fjords and the magnificent Sunnmøre Alps. Time has stood still here in Ålesund - you'll see sailing boats gliding through the fjord and fishing boats bringing in their catch of the day. The history of the old boathouses in combination with the modern and international décor creates a wonderfully continental atmosphere. The Hotel Brosundet is a natural starting point for all those wishing to explore Ålesund's wonderful Art Nouveau buildings, the fjords and the Sunnmøre Alps, as well as the coastal culture and open sea. Read more about Ålesund here. Hotel Brosundet has 131 hotel rooms including the charming Molja Lighthouse, a true landmark and a unique hotel room that is located at the edge of Ålesund Harbour, just five minutes' walk from the Hotel Brosundet. When you stay in the Molja Lighthouse, breakfast is delivered to your door every morning. It is an ideal bridal suite or for those looking for a bit of an adventure! Read more about our hotel rooms and the Molja Lighthouse here. We have a great restaurant called MAKI that serves fresh, seasonal produce and a daily changing menu depending on the catch of the day. Guests can also enjoy carefully selected wines and a wide range of beers in this relaxed and popular meeting place in central Ålesund. The Brosundet Bar is known for its wonderful atmosphere and for having an excellent range of beer, cocktails, wine and champagne. It is an ideal venue for informal work meetings and fun nights out with friends. Read more about MAKI and Brosundet Bar here. The Hotel Brosundet has functional and elegant meeting rooms, as well as a boardroom. The pleasant atmosphere and wonderful décor will ensure that you have a productive day! Our meeting rooms are equipped with wireless AV equipment, video conferencing facilties, hearing loops, and sound systems with ceiling and front speakers. The equipment supports online connectivity. Read more about our meeting rooms and what we have to offer here. We understand the importance of being able to maintain a healthy exercise regime even when you're on the go. At the Hotel Brosundet, you are welcome to use the gym that is equipped with both cardio and weightlifting machines. The relaxation area provides a tranquil oasis where guests can enjoy a sauna, Turkish sauna and solarium at the end of a long day! The Hotel Brosundet is part of 62°NORD. We arrange customised programmes for our guests with activities and experiences in Sunnmøre. The hotel has its own boats and helicopter so that you're adventure can begin as soon as you step out of the lobby! Ålesund and Sunnmøre are the ideal starting point to explore some of Norway's most beautiful natural surroundings. With activities right outside the door, this is the ideal place for a fun-packed and exciting stay. The hotel has a long and fascinating history. The name comes from the old "Brosundet" harbour. The building itself is a former packhouse that was built in 1918, and dried and salted cod was packed here for export to Portugal and Brazil. It is this long history in combination with a new, urban and international style that provides Hotel Brosundet with such a wonderful, continental vibe. The cod fishing industry has been hugely important for Ålesund and you can find out lots more about this from the various exhibits at the hotel. Bus to Ålesund Bus Station. Train to Åndalsnes. Bus from there to Ålesund takes about 1.5 hours. Airport bus to Ålesund Bus Station. phone +47 70 10 30 00.